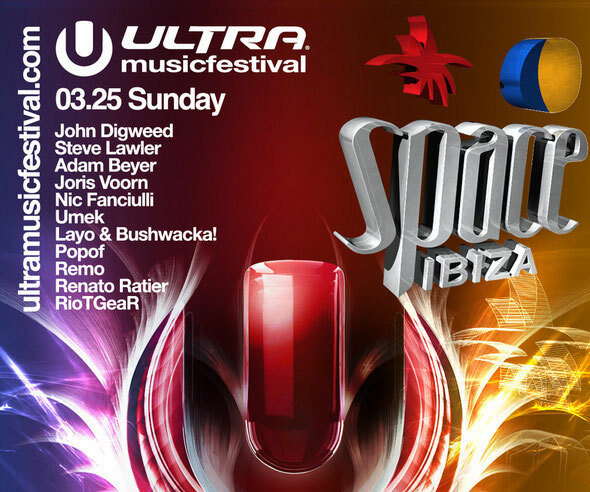 For a third consecutive year, Space Ibiza is making its way back over the Atlantic to hook up with the crew at Ultra Music Festival - a three-day event held in Miami from the 23rd of March. As the grand finale on the 25th, Space Ibiza will be taking to the stage and unleashing its vast array of goodies to represent Ibiza and this year, Space is showcasing some classic, dance music heroes with a roster of time-served "Ibiza" artists including John Digweed, Steve Lawler, Adam Beyer, Joris Voorn, Nic Fanciulli, Umek, Layo & Bushwacka!, Popof, Remo, Renato Ratier and RioTGeaR. As the USA’s leading EDM music festival, Ultra is renowned for being a spectacular event that has, over the years, attracted more than a million people from 71 countries around the globe. This year alone, a projected 150,000 music lovers will make their way to Miami for the experience of a lifetime. The organisers behind this mega-festival are planning to knock the ball way out of the park with this year’s almighty line-up. Four hundred of the planets most prominent DJs, bands and artists will be smashing it over three days on a colossal 24 stages, with legends Carl Cox, New Order, Fatboy Slim, 2many DJs, Fedde Le Grand, Tiesto, Kraftwerk (Live), Justice (Live), Avicii, David Guetta, Armin van Buuren and Skrillex, the recent winner of three Grammy awards, headlining. UMF also has a stash of awards under its belt. From 2005-2011 the International Dance Music Awards (IDMA) voted UMF Best Music Event, from DJ Awards (Ibiza) Best International Dance Music Festival 2008 and in the years 2005 to 2009 The Village Voice Media New Times awarded UMF the title of Best Festival.